One of the best things about 2016 was receiving two awards – I was totally shocked and surprised…I thought the first email was spam! 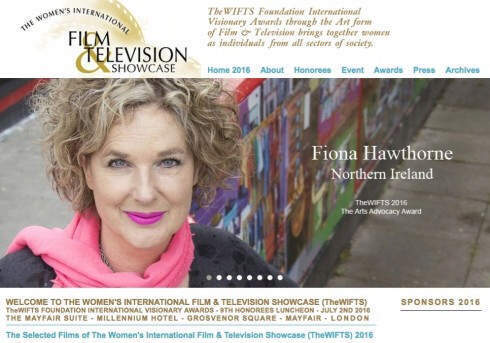 I was thrilled to be made a 2016 honoree of “The Women in Television and Film Visionary Awards.” Specifically I received ‘The WIFTS Arts Advocay Award 2016’. This is the short film produced for the awards event. Watching it I feel genuinely moved remembering all the great people – especially the children from the many schools and community projects I worked with, and remembering their fantastic art, and all the good times during the adventure of the last 20 years. A couple of months later I was again surprised and overjoyed to be nominated a Southbank Centre’s Changemaker, in recognition of all the years working with Fox Carnival Masquerade Band on projects for Notting Hill Carnival. It was great to meet the other Changemakers from all over UK and to see their work, but the best part of the day was offering up some of my work for the Southbank Festival. Instead of a carnival arts workshop, I suggested UFO Steelband play. I got to play pan at the Royal Festival Hall – a fantastic ending to a wonderful day! This gig was particularly special for UFOs as we launched the UFO Pilots, our unique band section for blind and visually impaired players. They sounded great and went down a storm and we were able to demonstrate to the public how steelpan offers great access to music, and needs to be brought into the musical mainstream. To see our steelband website click here.